A Facebook discussion I had with the Space Advocate got me thinking about the probability of becoming an astronaut. He had pointed out that a gambling website cited the odds of becoming an astronaut in the US as 12,100,000 to 1. According to that site, this is approximately the same as winning the California lottery (13,000,000 to 1), becoming President (10,000,000 to 1), or becoming a saint (22,540,000 to 1). 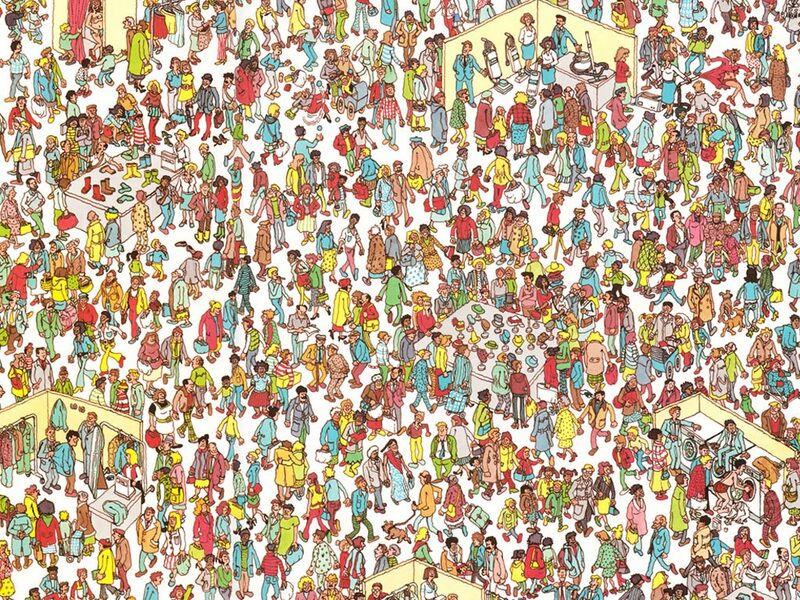 Maybe instead of "Where's Waldo? 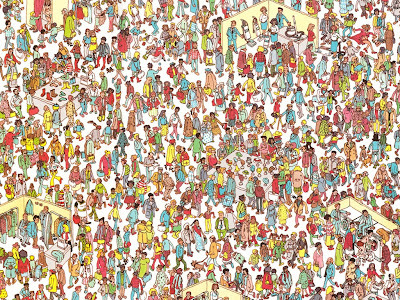 ", the cartoon should be called "Where's Astro?". In this post, I'll try to verify these numbers and will also tell you about an exciting opportunity that could get YOU into space! The gambling website doesn't say how it came up with the figures, so I'll try to reverse engineer them. According to NASA, there are 112 qualified astronauts currently employed by the space agency. Let's bump that number up to 121 to include the 9 new ASCANs too. The U.S. population is 304,059,724 based on 2008 U.S. Census Bureau estimates. Dividing these two values, we arrive at a ratio of 2,512,890 to 1. That's a lot smaller than 12,100,000. Perhaps they just counted the size of one astronaut class. There were 11 astronauts chosen in 2004, for example. Dividing the U.S. population in 2004 (293,655,404) by this number yields 26,695,946. That's about twice as large as 12,100,000, so it's in the ballpark. I could probably make this estimate more exact by considering only the portion of the population actually eligible to be astronauts. This type of analysis assumes a random probability distribution, implying that the chances for being chosen an astronaut (or President, saint, etc.) are equal for everyone. Of course, this isn't true in reality. Most people lack the right credentials to even apply for these jobs. Taking NASA's most recent selection, we see that 9 astronauts were chosen out of 3535 applicants. Of these applicants, only about 2800 were deemed "Qualified", so we could ascribe a selectivity of 9/2800 = 0.3%, which corresponds to odds of 311 to 1. That's more on par with your odds of marrying a millionaire or having your identity stolen. Of course, this estimate ignores the very real socio-economic barriers that prevent many people from even reaching a level to apply in the first place. Reality is probably somewhere between the 1 in 12,100,000 and 311 estimates. 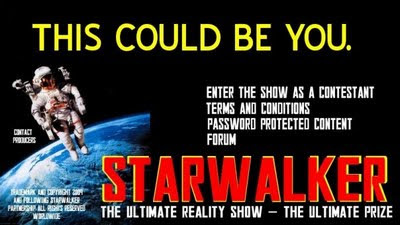 Starwalker is an inspirational reality TV show that demonstrates the accessibility of space, its benefit to humanity, the potential for private investment in space and the ability for the whole world to get involved in this New Age of Discovery, via a televised competition to select and train two astronauts from the ranks of the common global population, assisted by world experts in human spaceflight. The show culminates in two winners flying into orbit as fully-fledged astronauts on a Soyuz rocket. There will be two main competitions run in parallel: one for citizens of the Southern Hemisphere and another for those of the Northern Hemisphere, each involving physical, psychological and skills testing along with such activities as survival training, skills testing, joy flights and analogue studies. A significant portion of the show will be dedicated towards showcasing the facilities, achievements and projects of space agencies, companies and organisations around the globe to demonstrate the global nature and interconnectedness of the space industry and excite the public in a ‘Top Gear’ style approach. Starwalker is the best, and indeed biggest, attempt ever made to create a permanent shift in the consciousness of the public back to the sense of wonder and the majestic human glory of the Apollo era. And Starwalker is a direct appeal to the people of the Earth, without the detrimental filtering effects of governmental or journalistic interpretation. Space experts will speak truth direct to the people, and the people will answer with the love and respect that space travel deserves. A space-based reality series isn't a new idea, but if the press release is accurate Starwalker will be the first successful space reality show to finally get off the ground (literally, I hope!). They don't say specifically who is funding the project, only that funds are all "in place in trust and escrow." I find it interesting that they claim the show will be carbon positive "several times over, including the entire overseas carbon footprint of every aspect of the launch into space of each of the two winners." If this catches on, maybe every space launch can at least become carbon neutral. Famed theoretical astrophysicist Steven Hawking is supposedly even attached to the project too. One controversial aspect of Starwalker is that it involves separate competitions from entrants in the southern and northern hemispheres. According to the World Bank, the global population is 6,692,030,277, with about 90% of the people living in the northern hemisphere. Since the competition will chose one winner from each hemisphere, this means your odds are 1 in 6,022,827,249 in the north and 1 in 669,203,028 in the south. 6 billion vs. 700 million! Why the favoritism towards the southern hemisphere? The answer is simple: 2 of the 3 series co-founders are from Australia, and they want to boost their country's spaceflight stature. I can't be too angry at their decision; after all, they're fellow ISU alumni. The Starwalker website isn't online yet (Nov 28 update: now it is), but you can stay in the loop by following its blog, Twitter profile, Facebook Group, or Facebook Profile. Earlier in your piece you note the very real socio-economic barriers to many who might otherwise aspire to be an astronaut, and in addition to the "we come from there" factor, the other reason the show is north-south is to try and be a little more equitable. Many southern entrants are going to face massive additional hurdles in getting into and through the show, and I think it's important to try and redress that. While I agree with your calculation of odds of selection (about 0.3% for Group 20), I would consider those the "minimum odds" at best. While about 2800 candidates met the minimum qualifications for the Astronaut Corp. (B.S. Degree in a STEM field + 3 years of professional experience), as you can see from the most recent and previous selections, those chosen exceeded those requirements by quite a bit. As one grows in each field, their odds of selection improve relative to all other candidates. The only way your odds will ever truly worsen, is when you stop learning. I too concur with Gary. It's not about odds, it's about continuing to work hard and to never be fully satisfied with what you know or have already learned. Another interesting aspect of the Starwalker show for potential future NASA astronauts is whether participating in the show will help or hurt one's chances with NASA down the road. On one hand, if you carried yourself well and excelled in all of the challenges the show presents you, I could see that helping your eventual application to NASA. On the other hand, being a reality show, it could over-emphasize personality issues that may make you look bad, which could ultimately hurt your stature with NASA. o wow this is real? a reader sent me a link to an article about Starwalker and it thought it was a parody, but now i see the blog and wonder if this will take off?? agreed it might hurt stature, as there seems to be an unspoken creed among astronauts that those who prove too "press hungry" are somewhat looked down upon, but i've never understood that. I don't know if it's real. I hope it is. The more I read the confusing comments from the show's creator (see this thread or threads on Facebook), the less convinced I am this show is genuine. Plus, the application process is very suspect. All it asks for is one's name, email, and postal code. How can they choose contestants based on only that information? Finally, if you want to enter via text message, it'll cost you about $10. Why? Maybe the whole thing is just a money-making scam. However, the optimist in me is holding out hope that this will be a real show... for the time being. I really enjoyed your post. Not only was it interesting to see the numbers you came up with, but I was just having the "odds" discussion with some friends of mine. After batting around some statistics our bottom line was "You have to be better than one in a million". Never in a million years would my ego stretch far enough to believe that I'm better than a million other people. I have a bachelor's and master's in aerospace engineering, am a private pilot, am scuba certified, work in the space industry, etc, etc, so I would put my odds higher than someone serving a life sentence in prison, but ultimately I don't feel very positive about my chances. There are just so many amazing, incredible, motivated people that you really need that certain something to make it over the top. With NASA receiving 2,800 valid applications I think it starts coming down to who you know. I've spoken with a dozen astronauts over the years and each of them had worked with people closely associated with the group or were military. So my conclusion? Apply to Starwalker and have fun. Scuba dive because it's awesome fun. Fly Cessna's because it's fun. Get involved with the local space community because it's fun! Just have fun! P.S. I enjoy checking out this blog and seeing what's happening with people who are motivated to pursue their dream. Those are words to live by. Thanks for sharing! This is a fraud. Do some research on Facebook. Look up Starwalker: It's all a bad fraud. Note that this post is from November and pre-dates the official announcement of Starwalker. I've been skeptical about Starwalker ever since the three ISU founders split from the project. I'm well aware of the dirt dug up on John Nolan on the various Parabolic Arc posts that are linked from Facebook. Plus, for some reason Starwalker denied my application even though they accepted applications from at least six of my friends. It's sketchy and likely too good to be true. Gambling is the worst social evil. It is the worst form of allurement that makes you lose money more often than not. Even I lost money with gambling in lotto and mega millions. It is a luxury only the affluent can afford! It is not for the common masses. did you know that the chances to win the superenalotto are 622,614,630 to 1 ?